Scene, near Khandalla, with distant view of the Railway. bl.uk > Online Gallery Home	> Online exhibitions	> Asia, Pacific and Africa Collections	> Scene, near Khandalla, with distant view of the Railway. 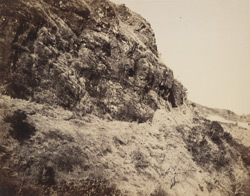 This photograph was taken by Captain C. Scott in the late 1850s and published in an album entitled 'Views on the Bhore Ghaut, shewing some of the Railway Cuttings' (1860). The railway connecting Thana through the Thal and Bhor Ghat inclines was the initiative of George Clark, Chief Engineer of the Bombay Government. The Great Indian Peninsula Railway Company developed the scheme in the 1840s and the Bhor Ghat pass was opened in 1861 as the main route over the Western Ghats, linking the sea coast with the Deccan. This view depicts the edge of a rocky hillside, with the line of the railway just visible in the distance at the extreme right. Bombay, presumably visible in the far distance when the print was made, has faded.